Genotyping of mice and examination of the expression of PTH and PTHrP. (a) Analysis of genomic DNA isolated from pups born of PTH–/– and PTHrP+/– matings. For Southern blots, purified DNA was digested with BamHI for PTH and with PvuII for PTHrP. The mutated PTH allele (4.0 kb) and PTHrP allele (1.8 kb) are distinguished from the wild-type PTH (6.2 kb) and PTHrP (1.0 kb) alleles using the probes described in Methods. (b–d) Thyroid and parathyroid gland paraffin-embedded sections from wild-type (WT), PTH–/–; PTHrP–/–; and PTH–/–, PTHrP–/– mice were stained with H&E (b) and immunostained for PTH (c) and CaSR (d). 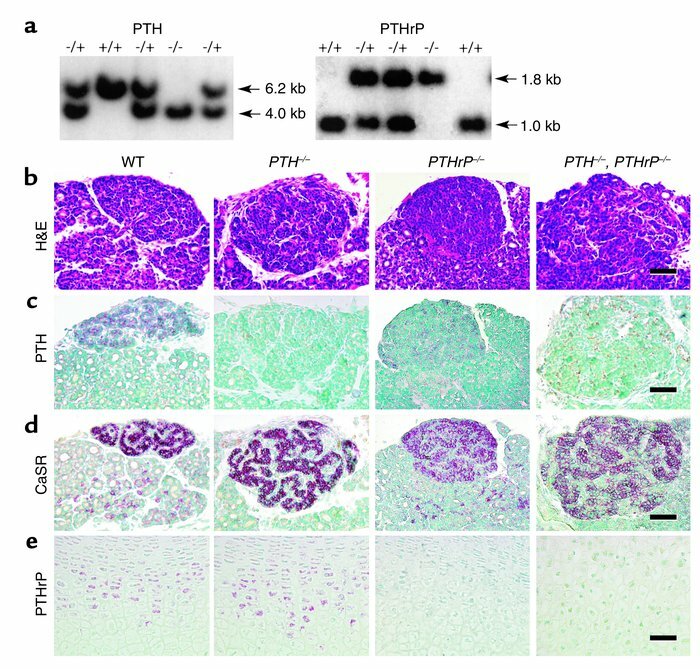 Paraffin-embedded sections of tibial epiphyseal cartilage were immunostained for PTHrP (e). Scale bars represent 50 μm.